This is a guest post by Israeli blogger Orli Yakuel, who has apparently spent a significant amount of time testing every single way of accessing Twitter. In this post she shares her experiences with nine of her favorite web interfaces for the Twitter service (we have one more that we like, too – tunein, that just launched a week ago). The tenth, of course, is Twitter.com – but the cool kids always want to be a little different. You can read more from Orli on her blog, go2web20. 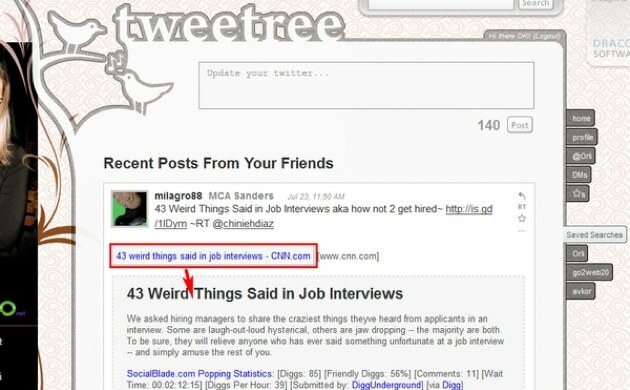 Believe it or not, almost 50% of Twitter users, prefer to tweet directly from Twitter.com. This isn’t surprising, but most heavy Twitter users agree that Twitter.com is actually the poorest user experience among the plethora of alternative web applications to access the service. But there’s one thing Twitter.com has going for it (besides being the default way all new users access Twitter) – it’s simple and easy to use. But after few months of using Twitter you begin to look for the retweet button, the auto-refresh updates, or a way to create groups, and moreover, you are looking for a better way to navigate through your endless list of friends and/or content. You won’t find these features on Twitter (although the Power Twitter Add-on gets you most of the way there), but here’s a list of alternative web applications that will let you monitor your Twitter account from your browser in a much richer way than the Twitter site itself. 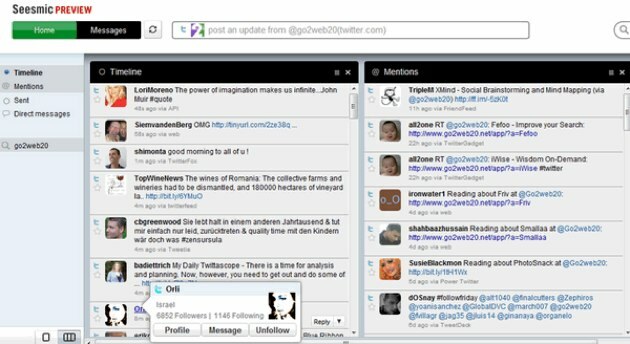 With Web Seesmic (Disclosure: Arrington still has a small investment in Seesmic), you can monitor all of your tweet activities in one place and in real-time. Easily navigate through your list of friends, choose your favorite layout, and more – all from a very clean and clear interface. So far, I’ve found Web Seesmic to have the most potential in terms of becoming your next Twitterstream service. There is still room for improvement, of course. When it comes to usability, the design is just too minimalistic. The retweet/direct messages should be visual and accessible via one click only. The “list view” navigation is better than the column, but the font is way too small (that needs to be changed ASAP). 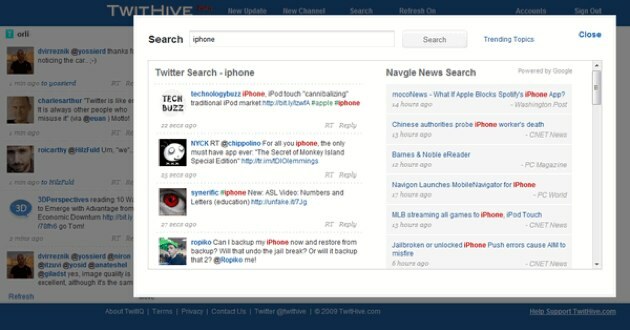 In addition, it lacks two significant features: The trend list, which becomes very important if you want to be up-to-date with timely news and current events, as well as a twitpic/yfrog integration. Surprised, I have to ask: Where is the main thing that Seesmic does so well? Video-based comments would leverage this app at least ten times more. Have they given up on video completely? Meanwhile PeopleBrowsr has it all. See all of your tweetstream, your mentions, DMs, search-based keywords, create groups, manage multi accounts from one dashboard, use a to-do list with quick tags, integrate with all your social networks, RSS import, map view, and tons of other features. The problem is – that it’s just too overwhelming! Even the most skilled power user on Twitter won’t need all of these advanced features. Luckily though, PeopleBrowsr has a light version that is more reasonable to use. Still, I did feel a bit lost in both the advanced and light versions. PeopleBrowsr provides so many other services that are related to any and all of your social activities on the web. The service actually reminds me of Zoho, which turned out to be the largest office suite on the net. Maybe this is the direction PeopleBrowsr is heading towards? – Your one-stop-shop for all real time activities. 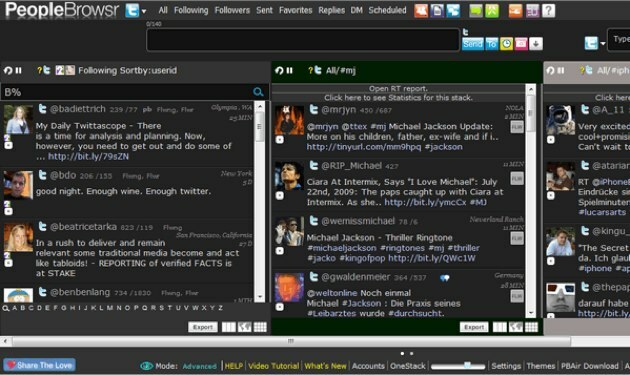 TwitHive is a multi-channel web dashboard for Twitter. The service lets you create channels based on your query. You can customize each channel whichever way you please. It might sound great overall, but during actual testing the service failed to impress me. The service is somewhat annoying to use – search and also new updates opens in a different layer, and column creation takes time, while other services do that for you automatically. One thing that I did enjoy and found unique was the integration of Google News and Blog Search alongside any search you perform. If you have several Twitter accounts that you need to monitor (personal plus brand(s)), you may consider using Splitweet. 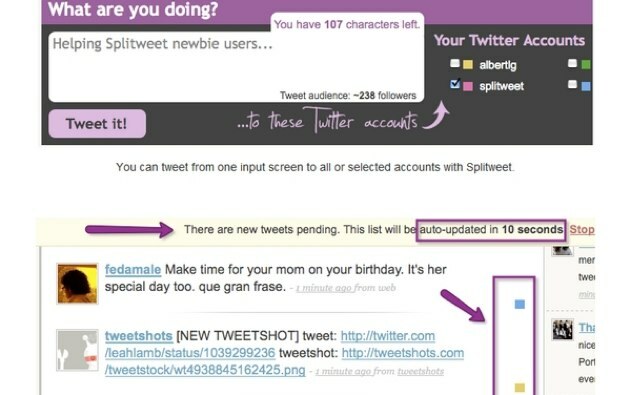 Splitweet allows you to compose a list of accounts and distribute tweets to more than just one account. You can also follow your contacts’ tweets from all of your managed accounts. OK, so here’s my problem with this service: Each account gets its own color, and Splitweet places this color coded box next to each tweet in the stream. Personally I think it’s a bit weird to have refer to various Twitter accounts by color. I rather see the username of the account, or a small icon, than to remember what color symbolizes that particular account. 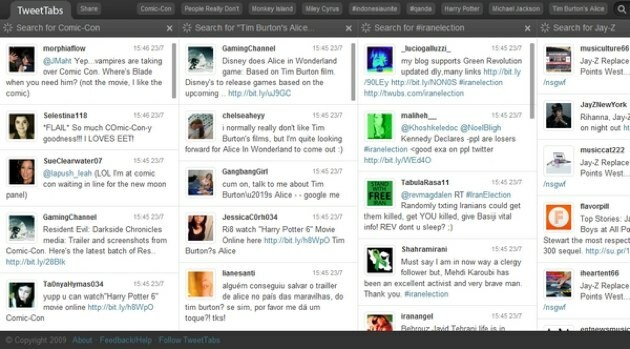 TweetTabs, a Tweetmeme project, is the easiest way to track trends on Twitter. It’s so easy, you don’t really need to do anything. Just enter the site and enjoy the stream of each trend presented on Twitter right now. Additionally, you can run a keyword search and it will automatically add it as a new column. There’s no registration whatsoever, and if you want to reply or retweet someone else’s tweet, you’ll be redirect to your own Twitter profile (which I found to be very useful always). Although on TweetTabs, you can’t see your friends’ streams or manage anything else beyond what I’ve mentioned above. 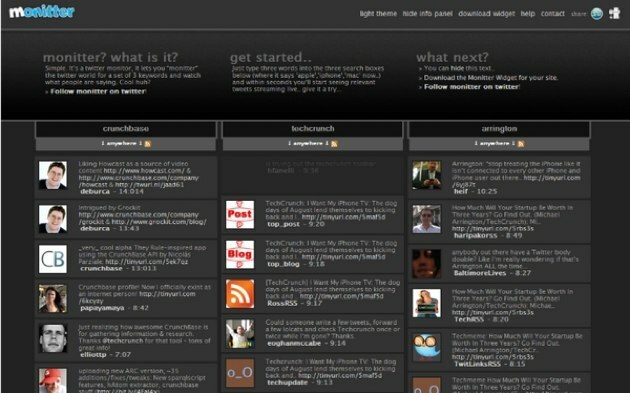 Similar to TweetTabs, Monitter allows you to track what most matters to you on Twitter without the need to sign up or in. Just type three words into the three search boxes (you are free to add more boxes if needed), and within seconds you’ll start seeing relevant tweets streaming live. The one thing that Monitter gives above all the others listed here is the ability to grab a real-time twitter stream widget for your site, with the option to customise the CSS to make it look the way you want. 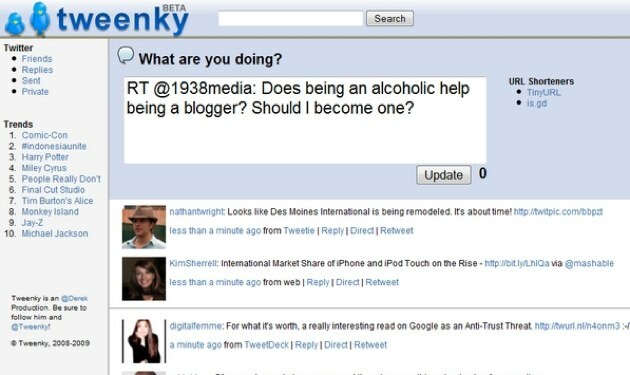 Kudos to Tweenky, for being the first service that enables real time tweets from the web. Unfortunately, it didn’t evolve any further. Their first version had this nifty Gmail look & feel, but for some reason, today, it just looks pretty plain and boring. Having said that, you may want to use it because of its simplicity. Tweenky is designed to be very obvious to the user. The list of activities and trends are accessible always, and the main stream is easy to adjust to. I found the larger font in the update box to be conveniently useful. 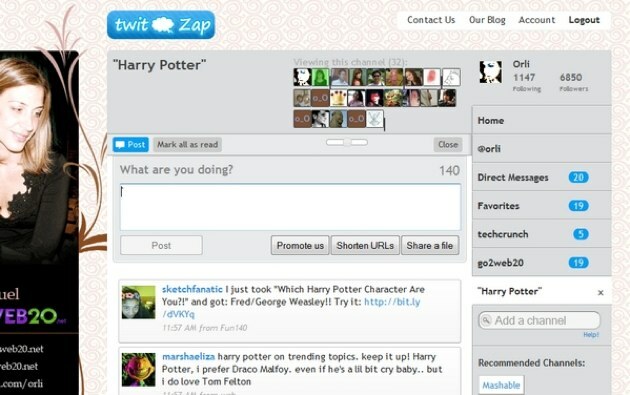 Remember all the buzz around Tweetree? I tried it again today and was surprised to see that nothing has changed (usually you get to see more useful features over time, no?). Anyway, it still a good service, if you want to see a bigger picture of your stream. Tweetree embeds external content so you get to see pictures, videos and even the text from submitted links right in your twitterstream. To be honest, I didn’t like how the service overtook the Twitter layout. If you already use Twitter in the background, go easy with your logos. In Tweetree’s case, they placed two extremely large logos on top of the twitter page, and it is just a distraction. It would have been less annoying to get all of the features without all of the noisy design around it. TwitZap is not half bad for a layer that sits on top of Twitter site, and frankly it has great tools that the others don’t have. First of all it lets you organize your favorite channels, then it shows you how many updates you missed when you’re not on the channel, which relates to a RSS reader experience. But furthermore, it shows you who are the people that are viewing the same channel right now, and this is by far the best way to find people based on a shared activity. The page refreshes in real time (you can even choose its speed), and on its browser tab you get to see how many of new tweets you’ve missed. 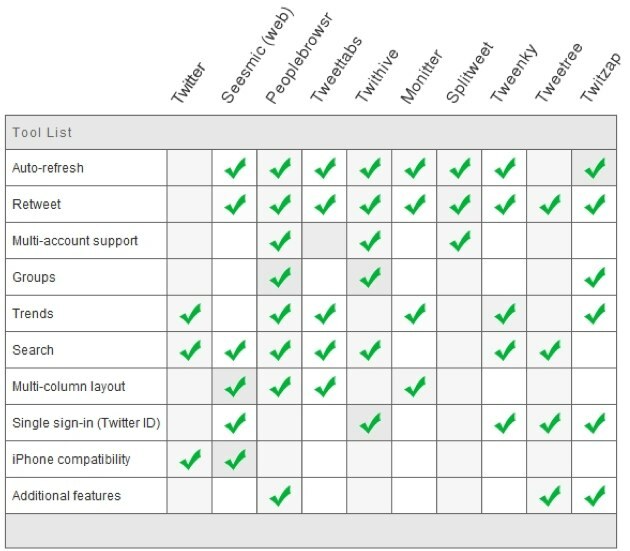 The bottom line, if I have to choose the best service among these 9, I think TwitZap is the winner (they should change their registration to a single sign-in though).